FOR 14 PEOPLE MAXIMUM ! ONLY QUIET GROUP ! In a quite and central area, green, just near Acropolis and museum of modern art, 5 mn walking distance to old city and port. This 9 rooms Ensemble of 170m² occupy a part of the terrace level of villa rima and the whole first and last stage ; it is divided in 2 independant flats. One with a big comon room with kitchen and acces to a big private 30 m2 sunny terrace, one bedroom and one bath and the other one with the 6 other bedrooms (thereof 2 with terraces and one with a cooking corner) a kitchen and 2 other bathrooms with WC. Smokers allowed only on the terraces. Very important : we accept only quite and respectful persons in the villa, no party people, only quiet persons. Ideal for a big family or a group of friends or couples with children, or for professionals who work at the Acropolis (7 persons can be housed in individual bedrooms and 10 persons in individual beds). 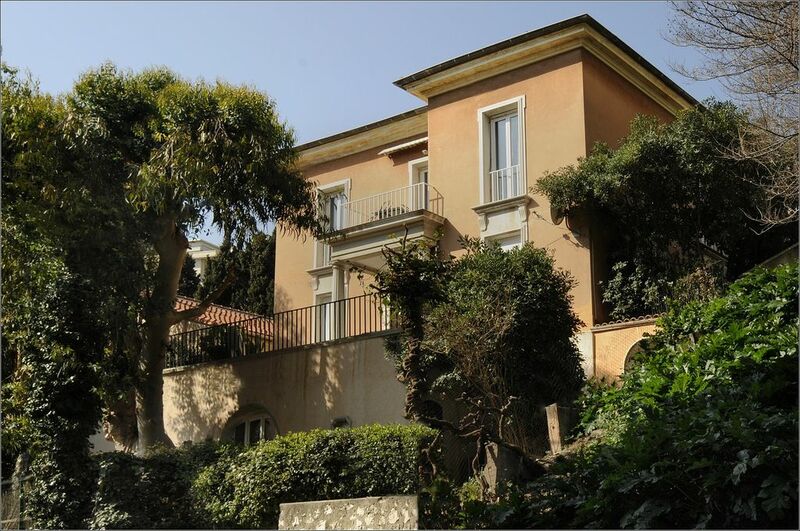 You could not be better located to fully experience the incredibly vibrant region of the Alpes Maritimes and Riviera. There is no need for a car, you can walk or take public transports to all amenities! We know the area well, so please, just ask us for information on restaurants and concert venues. There are plenty of activities at 2 mm walk, to keep you entertained such as a cinema, museum, bowling and karaoke, amongst other attractions, tennis clubs and sport clubs. For winter days there is a big olympic swiming pool at 7 mm, with a modern fitness center with jaccuzzi, saunas, spas and UV centers, and a very big ice rink. I like to welcome nice and sympatical persons with whom I share with pleasure all my good tips about restaurants, city and region. I am sorry but I don't accept party people or noisy groups !! The location of the property is the perfect place to start a day excursion to one of the countless wonders of the coast or ” arriere pays”. Whether by car, by train, or with one of the many buses (1euro or 7 days Pass for 15 euros) departing from the nearby main bus station, you will soon be on the 'corniche' roads for a memorable side trip. On the road to the Mercantour or to the Vesubie, you will find picturesque perched villages with an important historical and cultural patrimonial . The beautiful city of Nice on the French Riviera has a lot to show, but don't forget to visit all the attractions of the Alpes Maritimes and surrounding areas. 2 bathrooms with showers , washbasin and toilets. I absolutely loved this apartment. It was spacious and the two balconys were ideal. The steps up to the apartment were fine for those who are reasonably fit. However, I had my 82 year old mother-in-law with me and she did manage them twice a day, but not recommended for the elderly. The apartment had lots of character although the kitchen is basic and there is no english t.v.channel.Getting into the old town was easy on foot but parking a car outside the apartment could be difficult at times. Nathalie was extremely helpful and welcoming. I would definitely come back again and I have recommended it to many friends as good value. Acommodation is on the upper level with a nice central stairwell. Balconies at the front and back meant we could find the sun at most time of the day. We had a great week at Villa Rima. It is very ckose to Blockhead and Acropolis and only 5 minutes from the Old City. Kitchen facilities are acceptable for a holiday appartment. All in all for an appartment that can sleep 10 it was a good value. Un séjour qui restera gravé dans mes souvenirs tant pour la beauté de la cote d'azur et de Nice que pour la qualité de l'accueil et la convivialité de la propriétaire. Nous revenons régulièrement et chaque année! L'appartement est très agréable, spacieux et clair. Il ne manque rien. On se sent tout de suite comme chez soi. La place Garibaldi est à 5mm à pied et tout est à proximité. Par contre pas évident pour se garer dans la rue le soir mais on a pas eu besoin souvent de la voiture. Je recommande vivement! super sejour a nice !!! Nous recommandons vivement la villa rima et comptons y retourner bien vite !!! Der Aufenthalt in der Villa Rima ist super schön gewesen. Die Villa Rima liegt in einer ruhigen Wohngegend, nahe der Altstadt und nur 10 Gehminuten zum Strand. Die Wohnung ist einfach, geschmackvoll eingerichtet und hat alles was man benötigt. Die Eigentümerin Nathalie ist eine sehr gastfreundliche, herzliche und immer hilfsbereite Person, die sehr gute Tipps für Ausflüge, Restaurants etc hat. Die Villa Rima kann man weiterempfehlen!!! To locate the Villa, tipp on google map : 'Villa Rima, Nice ! The Villa is easyly accessible by all means of access with or without car and perfect place to start day excursions to one of the countless wonders of the coast or 'arriere pays'. Whether by car, by train or with one of the many bus departing nearby, you are rapidly on the strategic places to visit. Access : From the airport, bus 98 to the center and stop at 'Segurane' just nearby. From the motorway A8 take the exit 'Promenade des Anglais' and follow Nice Center (centre ville). At the Acropolis (palais of congress), take left the Boulevard de Carabaçel and then the third street right. Drive about 100m and the Villa is on the left side of the street. Parking in the street is free; for more confort, at 7 mm walking distance, public parking 'Acropolis-jean-Bouin' with holiday degressiv rates (ask for 'abonnement congrès). Golf: There is a Golf in Biot at 30 mm with car or you can take the bus 59 at the station JC Bermond (10 mm walk) and go to the Nice Golf. There is a practice, a putting green and a club house. Only 9 holes but OK for training. Monday 15 euros instead of 25. Ski: Bus from main bus station Vauban to ski resorts Isola 2000, Auron et Valberg (at 60 km). Price1 euros (rbus 740, 750 and 770) 2 hours with the bus 1h30 by car.